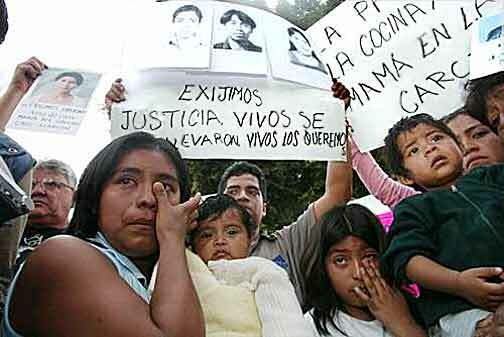 March of relatives of Oaxacan detainees in Nayarit, December 3. The following is a translation of a statement put out by the Grupo Internacionalista,Mexican section of the League for the Fourth International, and distributed in Oaxaca, Mexico City, Guadalajara and Tepic, Nayarit. DECEMBER 8 – The new Mexican government of Felipe Calderón is starting out under the sign of mass repression. Following the brutal crackdown of November 25, when the Federal Preventive Police (PFP) attacked participants in the Seventh Mega-March in Oaxaca, a genuine state of siege has been imposed on the state. Currently the number of those arrested is estimated at 500, of whom some 300 are still behind bars. To those must be added approximately 100 who were jailed in previous weeks, some 60 disappeared and 21 opponents of the bloody Oaxaca governor Ulises Ruiz killed. Now the manhunt has spread to the capital with the arrest Monday night (December 4) of Flavio Sosa Villavicencio, the most prominent spokesman for the Popular Assembly of the Peoples of Oaxaca (APPO). Although he had three federal injunctions against arrest, Sosa was yanked out of a taxi in the Colonia Roma neighborhood of Mexico City along with four other APPO members. The next day, the murderers of the American journalist-activist Bradley Will were released. The aim of Mexico’s new head of state and his sinister Interior Minister Francisco Ramírez Acuña is to carry out a “quinazo.” They are looking to deliver a fatal blow to the mass strike that has convulsed Oaxaca for more than half a year. The PAN (National Action Party) president wants to repeat the “exploit” of PRI president Carlos Salinas de Gortari, another president who entered Los Pinos [Mexico’s White House] amid protests against massive electoral fraud. Salinas began his six-year term by sending the army to arrest the leader of the Mexican Oil Workers Union, Joaquín Hernández Galicia (known as La Quina). He was able to get away with this because of the lack of a powerful response on the part of the workers movement. Today the League for the Fourth International and its Mexican section, the Grupo Internacionalista, are calling for a national strike against repression and for workers actions internationally to demand the immediate release of all those arrested and the presentation of the dozens of disappeared alive. 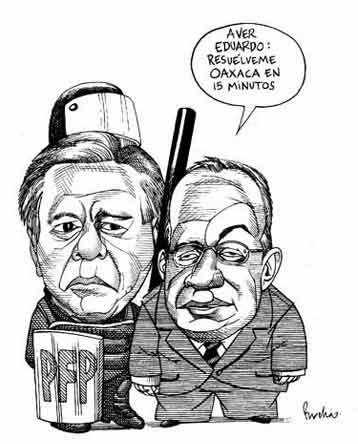 Felipe Calderón to attorney general Medina Mora (former head of the federal police): “So, Eduardo, settle Oaxaca for me in 15 minutes.” Calderón’s predecessor as president, Vicente Fox, had promised to settle the Zapatista rebellion in Chiapas in 15 minutes. (Cartoon by Rocha/La Jornada). Upon taking office on December 1, Calderón stressed his supposed openness to dialogue. “I formally reiterate my invitation to a dialogue of all political forces. For the good of Mexico, this dialogue cannot wait,” he said. Despite this formal declaration, two days later the leading spokesman of the APPO was apprehended by the Federal Investigation Agency (AFI) after leaving a press conference where he announced coming talks with the federal government. Nor is it the first time this has happened: on February 28, Flavio’s brother Erick Sosa was picked up two hours before scheduled talks with the delegate of the interior ministry (Gobernación) in Oaxaca. If the murderous governor Ulises Ruiz wants a “peace” of the graveyard, the repressive president seeks a “dialogue” behind bars. Imitating the dictatorship of Porfirio Díaz, who in 1902 dispatched Yaqui Indians captured in Sonora to far-off Yucatán, in 2006 the interior ministry, already under the supervision of Ramírez Acuña, has deported 141 Oaxacan prisoners to Nayarit. Every day that passes the number of arrests climbs; house-to-house searches continue, along with kidnappings in the streets of anyone “suspected” of being an APPO supporter. They want to intimidate the large majority of the Oaxacan population, consisting of indigenous and working people, which has fought to remove Ruiz. They keep piling up the most absurd charges against those arrested, including sedition, kidnapping, robbery, injury, damaging property of others, plunder, etc. The authorities’ aim isn’t so much to prove that crimes were committed but to keep opposition leaders out of action. That’s why they are carting them off as “highly dangerous” prisoners to federal prisons far from Oaxaca. A witchhunt against teachers’ union leaders of Section 22 of the SNTE/CNTE is underway: at least 90 Oaxacan teachers are presently under arrest. However, the teachers of the Valles Centrales region refuse to be intimidated: they have threatened to go back on strike if they don’t get satisfaction by today, December 8. Ruiz is trying to create in Oaxaca the conditions of a bonapartist dictatorship, while Calderón, who received the presidential sash from a military officer in a private ceremony, is proposing to govern with a “firm hand.” His new interior minister (who as governor of the state of Jalisco orchestrated the brutal repression in May 2004 of demonstrators against the Iberian-American Summit in Guadalajara) is notorious for his use of torture against “rebels.” His favorite technique seems to be breaking prisoners’ fingers, a practice which several of those arrested on November 25 have suffered. He likes to make mass arrests “so that others can learn.” In the face of the drive toward a police state, it isn’t enough (although it is quite necessary) to undertake a campaign of defense of legal rights; a mobilization of working-class power in a national strike is urgently necessary, with powerful national work stoppages by the most directly affected (teachers, university professors) and combative (electrical workers, steel workers) sectors. Following the bloody action of the PFP in close collaboration with Ruiz Ortiz’ state Ministerial Police, the PRD (Party of the Democratic Revolution) is now trying to coopt and channel (i.e., contain) the struggle in Oaxaca. Now, but not earlier when the strike movement was mounting, the Zapatistas’ “Other Campaign” is calling for actions on December 22 (after its bogus “national work stoppages” on November 20 and December 1, which just happened to be holidays). PRD Congressmen are promoting a bill for “amnesty.” What do the Oaxaca teachers, workers and students who for more than six months heroically resisted all attempts by the bosses, their parties and their government to crush them have to be pardoned for? Nothing! Their real “crime” – which led to the evident “ungovernability” of Oaxaca – has been to question the dictates of the ruling class. The response of the Mexican working class to the repressive onslaught must be a crushing display of its own power, infinitely greater than that of the bosses, their state and their parties. Down with the PRI, PAN and PRD! Break with the AMLO Popular Front!